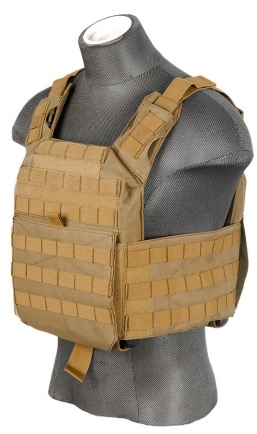 The Lancer Tactical CA-313 Speed Attack Plate Carrier in Tan meets the need of those looking for mobility and carrying capacity in a quick to adjust system. 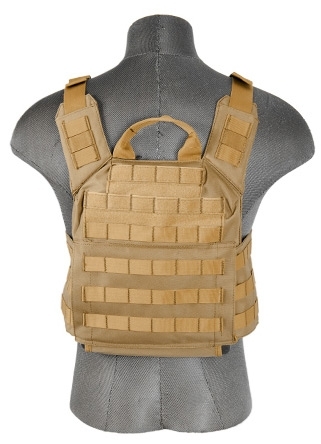 Carry as much, or as little, through its 360-degree MOLLE platform panels found on the front, back, and sides. Wide padded and adjustable shoulder straps come standard to provide better support and comfort to wearers. While a front integrated flap pocket is available for the storage of accessories. For lighter load outs remove the optional cummerbund by undoing the cummerbund closure on the front flap to reduce the drag and weight of your rig in a snap. Velcro panels on the front and rear portions of the Plate Carrier provide space for Velcro patches or identifiers. Made out of 600 Denier polyester materials to last you through the heat of battle whether you're running, gunning, or under fire, it'll be sure to stay and keep you in one piece over and over again. Plate compartments for ballistic plates (not included) can be found on the front and rear panels of the vest and can be accessed via Velcro flaps. 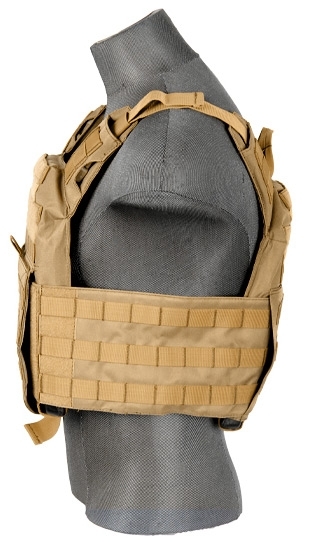 To be used with modern style ballistic plates airsoft versions are available however WILL NOT provide ANY protection against ballistics whatsoever. They can provide structure to your vest and nearly eliminate the sting of BB hits though however making these a perfect set for airsofters.